We are a producer only tailgate market located on College Street in the heart of Mars Hill University. The market will be held every Saturday morning from 9-12 until October, when hours change to 10am-1pm. We offer fresh local produce, herbs, garden and landscape plants, cheeses, meats, eggs, baked goods, jams, honey, soaps, tinctures, crafts & more! We can now accept Credit & Debit Cards. Throughout the season we plan to have local musicians and cooking & craft demonstrations. Sign up for our e-newsletter to get the latest weekly updates! 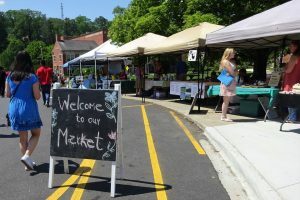 The market is now accepting new vendors! To apply, check out “Become a Vendor” page and fill out an application. Please excuse the construction here as we revamp our website.